I like the game, but I’m not paying for a bank of credits that I earned. That is ridiculous. I request friends for lives but NEVER receive them! Hate that you win a level and takes forever to get prizes! Don’t like the characters get different costumes but have the same power! Who cares give me something I can use when I win a level. Having the same character in a different costume is useless! Clear a level only to have to do it again? I like the game and all but honestly it bugs me that I can clear a level and get to the whole dancing part only to discover that it didn’t go through and that I’ll have to play the level over again. Playing three of the King games; Soda, Friends, and Candy Crush.Why should I have to pay $2.99 to get coins out of the piggy banks that I won? Getting penalized for winning! Doesn’t make sense and certainly not fair! I want to get piggy bank coins for FREE because I won them! I truly enjoy this game I can’t wait till the time I get to play it over and over again. This game is easy at first and gets harder and harder although a lot of fun! I gave it 4 stars because I never give 5 stars, it's very much worth downloading. Enjoy playing about the first 20 levels then put your thinking cap on!! Love the game it keeps me up and helps me relax. It’s a shame they don’t charge a reasonable amount weekly play. Games are the best but soon as you get into them so large chargers ring up. Once you’re addicted look for all the in game purchases in extras. So far I have been enjoying every day since I downloaded ! This game is now my favorite game ever! I’m so happy I got this game! I am at lvl. 110, and it is just getting better and better as I go! 10/10 and 100%! Whoever made this game, I will give you 1,000,000 thanks! This game was very good and the only time I can play is when I get home. Would recommend to friends, IS free to play! Just downloaded this app today and got through the first “world”. So far, I’m enjoying the game as much as the original Candy Crush. I like that you can choose which character you will play and that they give different items to help you depending on the character. The levels are pretty fun and can be challenging - i always aim to get three stars before moving into the next level. I don’t understand why some reviews say that they had to pay before playing the game because it is a free download - there are options to buy items in game but not necessary. Overall, I’d rate this 4/5 stars. Keeps my interest and makes me want to keep playing - just like binge watching a good show . Lol. Would recommend to friends. Thumbs up! It’s very addictive and I can’t stop playing it! Whenever I earn enough of the 2-hour bonus power up, it forces you to use it right then and there. Sometimes I don’t have time to play more than one or two games and if I get a 2-hour power up during that time, it’s basically wasted. Let US choose when to start our 2-hour power up so we can make sure we have sufficient enough time to actually USE it. This was one of my favorite games but for a couple weeks now every time I click a character to play a level I get a notification that something is “downloading” but never finishes so I cannot play at all. Game pisses me off a lot but that’s okay still love it. I don’t understand the friends part of this game. It lists my “friends” but I do not know any of them. They also never give lives if asked. Someone told me they can help you win a level. How does that work? I have never had anything say “ask for help.” I am on Level 467 and have done it all myself without buying anything. Takes too long to win helpful items. Sweet candy crush ooh my tooth hurts!! Like a baby I want more. This is the most addictive game I’ve played in years!! Why is it that the fish or bond or whatever I need will not be put on the board in the area that it's needed? I'm on a screen now and a bomb was placed at the top left corner and clearly the spaces they were left to clear were on the bottom left. So far it's fun, no glitches. But, it takes a long time to build rewards & even though u have gold bars u can't use them unless u pay to break piggy bank. Fun & challenging. Won level 540 at least three times and it will not go to level 541. Would have given a five stars rating if I could still play! The different outfits are pointless, why would I care about them they don’t do anything. At least have them do cooler things the more advanced they get. Seriously to many glitches, I’m just about over the game. I don’t plan on putting any money into it try working out the problems then I’ll keep playing until then peace! Life has so many obstacles... this game is a nice escape. Pretty nice but one thing. That one thing is the sticker for character things they are super hard to collect! Its a fresh twist on an oldie but goodie. I love the characters and their abilities. Great! Love the optics you did a great job on this one🤗 Still LOVING it!! Don’t think you should have to pay to get your money that you’ve collected what’s the purpose 🤦🏽‍♀️🤦🏽‍♀️🤷🏽‍♀️. But other then that I like the game. This is my new favorite game! It’s very fun. However, I only gave it four stars for several reasons. 1. I hate having to wait for the characters to stop waving, dancing, etc. to start playing the game. 2. I get points after passing some levels, and they aren’t very helpful. You only get about six or seven points each time. The points mostly go toward costume changes, which I could do without. You have to play FOREVER to collect a lollipop hammer or a supercharge of a character’s power. Also, when I am able to open the chest, there is nothing in it except for a few points! I don’t even worry about trying to get to it anymore. 3. I don’t like that the jam is red. I wish it was purple, like in Candy Crush Soda. 4. Why are there people that I don’t know playing along with me that are showing up as if they’re my friends? They have animal faces and just say “player”. When I go to my profile, there is no option to change my picture to something else, so it truly seems like there are strangers showing up when I pass them or when they pass me. What is the point of this, and can I stop it? THE BEST OF THE ENTIRE CANDY CRUSH SAGA! I loooooooooove this game! I have sent multiple screenshots of this game to my family & friends to show them how adorable it is!!! Many people think it's like Words with Friends but it's NOT and I love that! 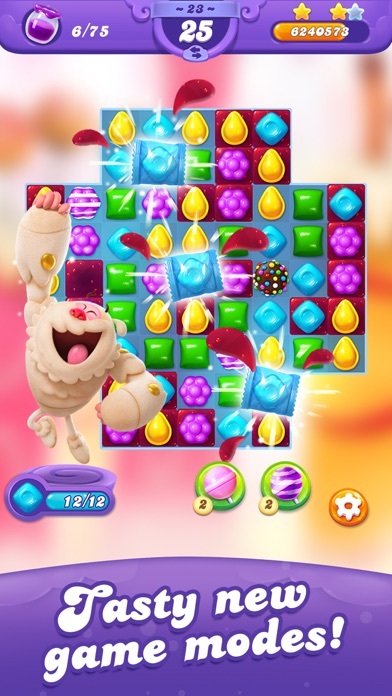 The Candy Crush Friends pertains to the fact that you play with "friends" in the game who throw boosters on to the board for you (the girl, the yeti, the nutcracker, etc)! If I could attach screenshots I would. It's so cute and fun. Before this game the Soda Crush was my favorite but this quickly replaced it! 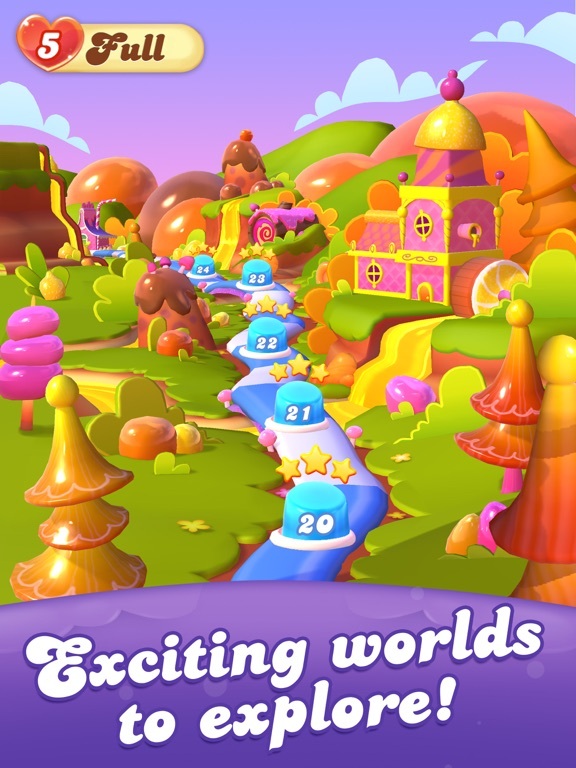 I don't know if they made this game in response to people complaining about how hard Candy Crush is but it FEELS like that's why because this game seems to make it easier on you to get through levels-- even if the levels do become more challenging. My mom and my 9-year old daughter stopped playing Candy and Soda Crush because they got discouraged when getting stuck on earlier levels. 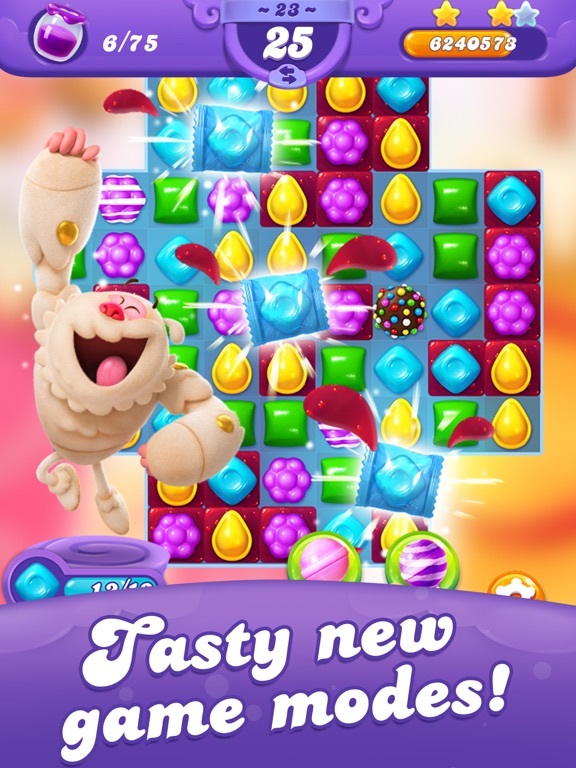 I feel like this game will revive their love of the Candy Crush puzzle game. Plus, it's just way cuter and more fun I think. Hope this helps! I would give it a 5 star review, except for the fact that I have not received a single life yet, despite playing the game since it came out and asking for lives multiple times per day from friends. Please make this work or let us earn free lives somehow. I am on level 248 and it’s all pretty dificult at these levels. Now add not receing free lives and it becomes quite frustrating and limited if you can no longer play until slowly the lives refresh again. Also, a suggestion for the daily rewards, why not limit them at 30 or 31 days and each day the gifts are better, including free lives, then reset back at 0 and build up to higher/ better gifts with each day until the 30/31st again. Let us enjoy some rewards without forcing us to spend money. Introduce some rewards or lives in exchange for watching a video ad for a different game as many other game makers here do. look at Tropicats if you need a good example of how they are doing their daily rewards and what you earn when you win a level. This game is lots of fun. A cross between the original CC and CCSoda. A fun twist though: In the various modes of gameplay familiar CC characters help you throughout each level vs receiving a single booster to help beforehand. You get 2-3 characters to choose from before that round and each has a special power or talent they can help you with. You will also save up special points (instead of boosters) so you can dress the characters up in extra costumes. (Meh, not my cup of tea but I can see it being fun with the younger crowd.) However, these costumes do not seem to give additional powers or talents, they are just for fun I believe. So far the levels are challenging at times but not frustratingly so. I’m right around the 100 level mark so that may change. Hope not cause I’m really enjoying it. Feels more laid back than previous CC games. All in all lots of fun. 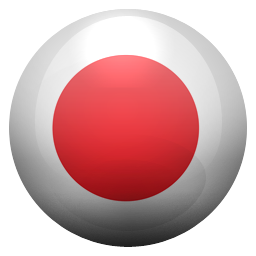 I recommend it to all CC lovers, as well as those previous CC lovers that fell away due to frustration or boredom. I think they’ll be in for a sweet surprise. No matter how fun this game is, you’ll eventually have to spend money, which is not what I want to do. If you don’t want to spend $4 to $8 a week every once in a while, AFTER you’ve already become addicted to the game...WALK AWAY NOW. I’ve been playing long enough to reach level 300 and I have 80% of the characters, and it’s a fun game. BUT...I’ve encountered several levels that REQUIRE more than the number of moves you get to complete it, which requires you to purchase coins and all. I’m on one now where I’ve been on this level for four days now. No matter what characters you play, it can’t be finished. I come within a move or two of finishing the round most of the time. I play maybe three or four times a day since you only have 5 lives (I can’t wait around for another life or ask for em or pay for em). I have already restocked that goofy piggy bank twice...I refused to pour any more money into this to complete a level. The game is stingy with the lollipops and other extras. I said the last time I got stuck like this that if I go more than five days stuck on a level? I’m not buying coins to finish it. The game is getting deleted. Looks like it’s about to go bye bye. Only started playing last night and I’m hooked! I’m totally obsessed with this game! I love how you have a friend to help you on a level and on some levels you can pick which one you want to use and that it even recommends which one has a better chance of helping you out to win. I love the different activities, the dunking cooking and freeing the octopus are my favorite levels. I’m already on level 56 to say that I’ve only been playing since last night. I read some other review on here that said it’s a mix of Soda Crush and the original Candy Crush. I couldn’t agree more. The only thing I don’t like is that with the piggy bank you earn gold bars if you win the level which can come in handy but have to pay $4 to open it. I won’t be using that feature too often, only when I really need it. But other than that, I have no other complaints. This isn’t my first Candy Crush game either, I’ve tried and played all of them 😃. This game is entertaining. I do like it. HOWEVER...some things drive me crazy, and not in a good way: 1. The worst (to me) is the manner of controlling lives. The inability to save some up, or even request refreshers unless I’m missing lives, is annoying beyond what I want to experience over a game. The refill rate is King’s 30 minute standard. Obviously they are doing this in money-making fervor—and they ARE a business—but I think it may backfire with this user. The thing is, most users don’t have hours of open time to play. If I want to play during lunch hour whilst eating, it would be nice if I could prolong the experience. 2. The dancing characters waste a precious bit of time during each round. It would be nice if King limited the dancing to the first 20 or so “introductory” rounds at the very beginning of the game. It started out cute, true, but like the three year old at home who was adorable pouting for attention the first time...it wears one out. First off I love this game and how you make characters that can help you in the game. They make the special candies and it’s super fun! I’m already on level 128 after two weeks. But I was a little upset with Candy Crush’s customer service... I asked them if they have the possibility to turn off the suggestions of the candies to match. The customer service guy was very rude and said “you can just ignore them”. And then I said, I was just trying to help make a suggestion and said it could be a setting where people can turn it off if they want. And I added, “I’d appreciate better customer service”. He edited his answer not a minute after reading my comment, to make him look “less rude”. I hope all their customer service isn’t like this... All in all I gave it a 4 star rating because I enjoy the game. I just wish their customer service could take from the players and add a few new stuff to the game. 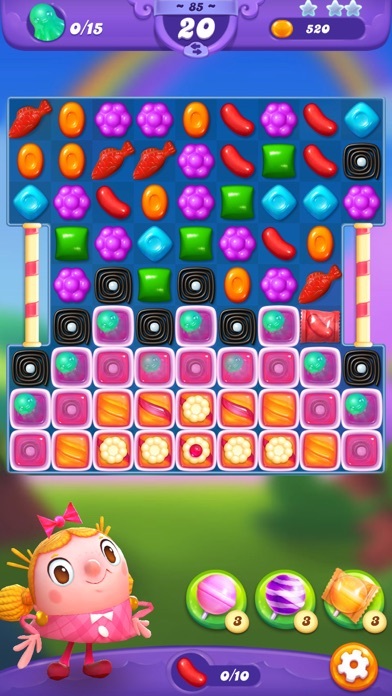 I must say I am rather disappointed with the new Candy Crush Friends Saga. I was super excited about the new game! However, I like a game that will give me a little challenge. This game is easy. Too easy. I recommend getting Candy Crush Saga. If you like a challenge. The game itself is pretty cool. For me it’s the levels, they’re just to easy. If you don’t want a challenge, than this game is probably just right for you. After I tried the game again... Oh my goodness! I was so wrong. I only played the first few levels, and based my previous review on that. I was then told that if I go till level 35- 40 it gets better. I find it has so many cool things to it. There are cookies that you have to get to the bottom of the screen, hearts you have to get into a box, and so many more things that even I haven’t discovered. I definitely suggest this game. You just have to get into it. 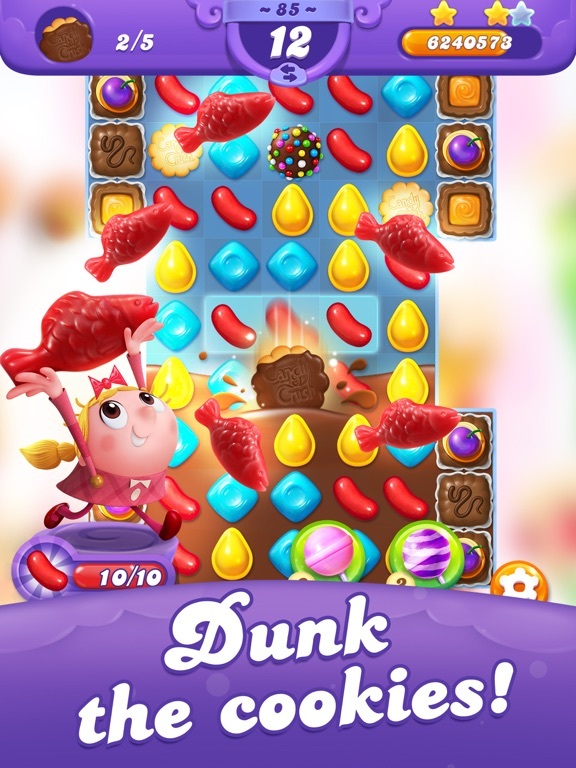 Unlike the other Candy Crush games, this one does not allow you to earn gold bars through game play. Let me rephrase: you “earn” the bars, just like in the other CC games, but in this one these bars go into a Piggy Bank. Every time your Piggy Bank is full (30 bars), the game tells you that you must empty your Piggy for $3.99 or else you won’t be able to accumulate more bars. Translation: you have to buy the gold bars, one way or another. Your $$ will go super fast if you do this. A mere five levels of 3-star play will put you at 30 bars! That’s crazy! There’s also no retry button the first time you fail to complete a level, which is annoying. No site map either, which could become a problem as you advance to higher levels but want to revisit previous ones to fulfill challenge requirements. Lastly, the animated characters waste too much time, too, performing their antics and taking time away from actual game play. Kids probably like it, but for those who prefer not to see these animations, a SKIP button would be much appreciated. Very fun game to play. An issue I have with it is that it takes "forever" to explore previously completed worlds and levels, which I like to do to get a better star count or enjoy extra fun completed levels. Another issue is that the bonus items(lollipop smash, gold bars etc.) are way too difficult to attain. They are so hard to come by I don't want to even use them because I will not get another one for ages, and the only way to purchase the lollipop bonus items is with a gold bar bundle of 30 dollars or more and thats for only 12 total lollipop bonus items. The amount of items you get for the price isn't acceptable, the player deserves more for his or her hard earned money. If these issues are addressed I would give this game 5 stars. Started playing a week ago and I am already passed level 270, definitely enjoyable! Just consider fixing the issues I mentioned. King really couldn’t be more obvious about cheating players. They “suggest” a “friend” for you to use in your game for each level. Each “friend” requires you to gather a certain color candy for them to be “useful.” No matter which “friend” you choose, whichever color required will be the one that shows up the least on the board...making your “friendly booster” useless. These “boosters” are always unhelpful when you do get to use them. 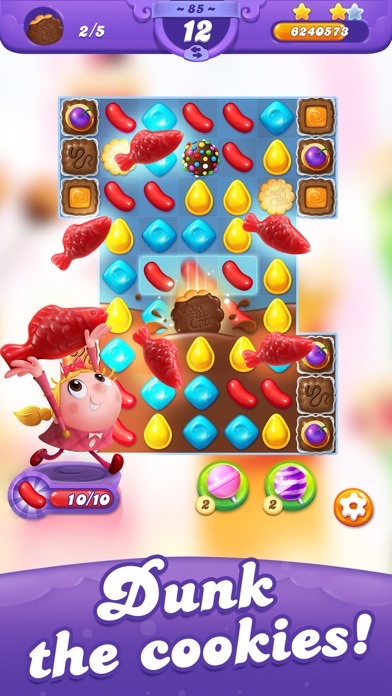 Bombs are placed where they’re unneeded, the nutcracker and squirrel blow up parts of the board other than where you need them to blow up to destroy candies, and fish are constantly hitting special pieces or candies that ruin a combo, or hit cookies instead of candies. Friends don’t screw up your game on purpose over and over again. These aren’t friends. They’re enemies. Enemies who cheat you. I’ve also witnessed (as in other King games) colored pieces randomly change color for no reason other than to cheat you. This game is a money grabber just like all other King games. They cheat you so you get frustrated enough to spend money or you quit. 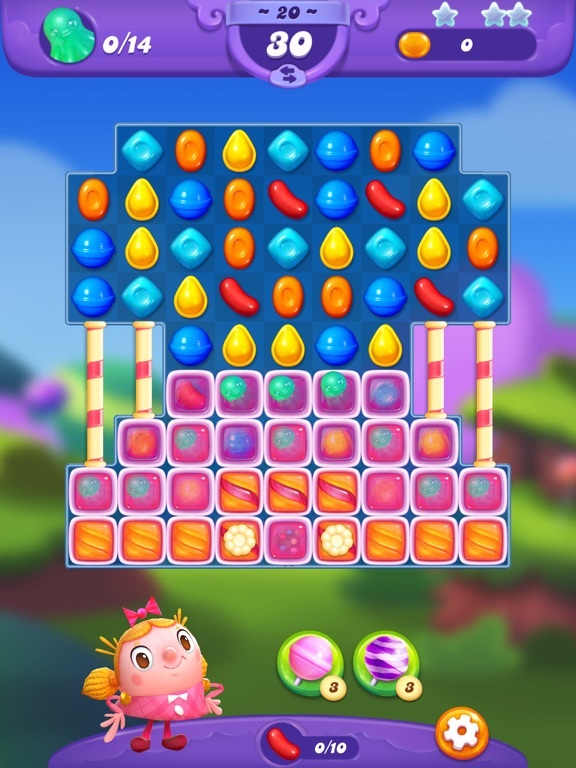 It is fun to play and they do have a little bit of a twist in this game from the original Candy Crush. It has already become a little challenging and I am definitely a little addicted already. Was definitely worth my time. I only have one annoyance and that is the piggy bank. I have been known to buy things in apps, but don’t tell me I’m earning something then at the last minute tell me it’s $3.99. If you want to do that then just do a quick pop up saying 30 bars for $4. And even if you do the whole earn the bars deal and want us to pay I could be ok with that, but after I say no I don’t want it don’t keep showing it to me EVERY SINGLE LEVEL. It gets extremely annoying and aggravating to have to watch that little clip where it tries to put the bars in and then having to tell it no every time. If I don’t want it I’m not gonna get it. Anyways that’s my rant. Other than that it’s a cute fun game. The game itself is really fun, BUT... between games there's always lots of really long animations, and most of them can't be dismissed, you just have to sit through them, and even though they're only a few seconds long, it adds up when there's like five animations between each game. It's just too much. Now for the really annoying thing... It doesn't preserve your game if you switch to another app or if your phone locks. I could understand if your game disappeared if you switched to another app for hours. But a few seconds to read a text message or something and you have to start over. Incredibly annoying because you have to sit through the start up again (which takes forever) but even more so if you're in the middle of a game where you're doing really well and boom, it's gone. I put my phone down for a few seconds to tell my kids goodnight and my phone locked. I woke it up right away, but the app had closed and my game was gone. King, you can do better. I like the vividness of the game as well as the choice of which animated player to use. The game is fun and challenging. However, I dislike the way in which prizes are given out and that there isn’t a way to earn more useful objects to beat certain levels. Most times I can only get one or two levels played then I am out of turns. The gifts that come up for meeting certain challenges are slim... like just two more points or sometimes maybe even one. It takes forever to not only progress in the game but to also earn objects that help in the harder levels. I am going to keep playing because it’s fun. But since both this game and Candy Crush have raised their prices I will not be buying extra lives etc... your a billion dollar company that just showed some greed with a substantial price increases. 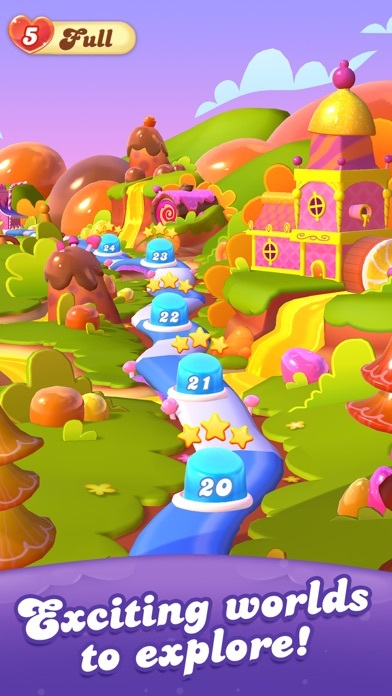 This is a really fun game BUT I noticed that I find myself always needing just ONE MORE MOVE in most levels almost ALL THE TIME so they either force you to (1) use your hammers/wrapped special candies, (2) use your gold bars to extend the game, (3) buy special candies/gold bars, or (4) quit. I NEVER buy anything and I’m so far into the game that I don’t have any special candies/gold bars left so I just quit and hope for the best on he next game. It’s just so annoying that I have to believe that the game puts you in that situation in order to get more people to want to pay. Bravo to the game designers then for making the game that way but it does get tiresome playing the same level over and over and over again and getting soooo close with just needing one more move but I REFUSE to pay so I will remain patient. Eventually, I am able to beat the board but it sometimes takes 10-20 times. Definitely the best to date Match 3 genre game. Lots of action and creative twists/options. Would be a 5 but I almost made it a 3 because of the PIGGY BANK. As someone who is a “completionist” with a little OCD, it’s frustrating to see at the end of EVERY LEVEL that my Piggy Bank is full n I’m “missing out” on additional rewards or whatever because I have to empty it.....no problem, EXCEPT emptying it COST 3.99! I’m NEVER going to empty it. Ever. All it is is Gold which can be used to continue a level when u run out of moves. Now I’m not against spending some money on a game; especially one that I’m thoroughly enjoying. I understand to “support the Creators”, but this is a CONSTANT reminder on something that I wouldn’t have purchased to begin with. Get the animation out of my life please and I’ll make sure to change this to 5 stars AND send 3 more 5 star reviews from my kids account. My only issues with this game are these: 1. it takes forever to scroll to get back to your world, or the other worlds you’ve completed. 2. The little friends that are supposed to help you, aren’t that much help sometimes. If I get all my candies for them to activate their “help” then it should help. Not completely put me in a situation where I have 3 moves left and can’t win the level. 3. Are the move algorithms messed up? Because I feel like I’m trying to best these levels, but dont have the opportunity to with the amount of moves they give. 4. The sticker idea is cool, to get rewards or costumes for your friends, but it takes forever to get them. I’m on level 80 as of now, and have completed one sticker reward.. Other than that, I’m a candy crush addict and I’ll play till the day I die. Without a doubt! I love candy crush. I’m over level 1000 on candy crush soda so when a new game came out I wanted to play it. I’ve had it for some time and I’m just so frustrated. The idea of “friends” that help you is great. BUT they don’t help you enough to not get stuck on one level forEVER. I’m not one to pay for boosts so I have to wait weeks to even get ONE lollipop which is ridiculous. there is never an infinite lives timer and you’re stuck for days and days on one stupid level. I get about 15 every 2-3 hours of playing this game and that’s dumb to me. I’m tryna waste a good deal of time once a day not 15 minutes every couple hours. I also with there was a way to preview the level before I choose my character. It’s super frustrating for a character to be “recommended” and then I go in and realize the character is not the best option and thus I’ve wasted a precious life. Only three things bad. 1. Not all my friends get lives and I don’t receive lives from all my friends. (Only 3). 2.you should be able to unlock the piggy bank without paying for it if you wait for it to fill up. A suggestion would be to put a higher limit on the piggy bank before you can unlock it automatically. 3. I like reading the messages and what the challenges are. They go by in a split second so you don’t even know what or how much you need to collect. Oh and 4. When you’re on the same level with someone you Can’t tell who it is because their icon is to small. If there is more than one they just stack and you don’t know who else is at your level like the original game. I do really love the game. I keep going from my phone to my kindle so I can play longer. I hope this helps. This is addition fun Soda’s game which I found really annoying sometime. 1st I know developer tries to make the game cute with those animated characters jumping around when starting level but, after awhile, it can be annoying with those. 2nd price for buying stuffs in this game is expensive comparing to other soda’s game. 3rd Not much magic power to help you thru the game. It takes forever to finally get special candies..... 4th this one I found it annoying the most, once you got special power, eg. you get extra fish when character collects enough required color candy to make special candy, that extra gift IS NOT helping at all. For me, it tends to mess my move and it just seems like it not helping but make thing more difficult. This happens not once but all the time! If the extra gonna mess my move, I rather don’t have it. First off once you burn through the gold you receive at the beginning of game play you can’t win more unless you want to pay real cash to break the piggy bank. I must call BS on that aspect. Board extras are a joke as well receiving lollipops to help defeat a board are impossible to acquire. Opening gift boxes to build up points for such things is too slow a process. Acquiring lollipops should be easier for the game player. Boosters do very little combing two of the sprinkle coated chocolate balls do nothing dramatic. Making one is tough making two is tougher making two next to each other is a miracle. Combining the two should clear the entire board of everything; pieces, obstacles, jelly covering octopuses, and should spread the entire board with jam. Again, this just another game that is fun to play until you need assistance and the only way to get assistance is to shell out real cash. This game is absolutely fantastic! I love how we’re getting to know the characters/friends. Tiffi’s my favorite so far! She’s the cutest animated 6 year old I’ve ever seen. Plus, who doesn’t like to have their screen surrounded by an adorable animation screaming at you and jumping around in different costumes? I love how the puzzles are all combined with previous CC games. We can spread jam, rescue animals, and a ton of other things. This game is so much better than any of the other CC games, in my opinion. I love it and I’m so glad I decided to try it out. I didn’t give it 5 stars though because I wish there were easier ways to get lives when we run out (without ads). There’s also no message area to get the lives your friends send. Other than that, keep up the amazing work with this one, King! I’m at level 403, so I’ve given it a good try. The game is enjoyable and I don’t mind it being challenging. I’ve spent a bit of money, as I don’t expect a game to be entirely free. The issue is that once you get to these levels, each and every level takes days, weeks to get through. Most you can’t get through at all anymore without spending a ton of money, as the prices for gold or helpers is astronomical. If I have to pay money to get through a level, then what’s the point of playing. Paying to get through one level, just to pay more to get through the next and then the next isn’t enjoyable. I’m deleting the game. And unfortunately, it’s like this with all the Candy Crush games. 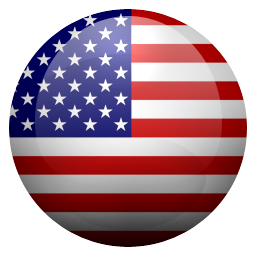 I play Toon Blast, which is challenging, but not insanely so. Even at high levels. They’ve mastered the fine line between keeping the game interesting, players engaged and spending money here and there but not making it insanely difficult. There is the good and the bad. Good: This game is fun and addicting. The graphics and animations are smooth. I love the bonuses as you are often rewarded for advancing. Bad: There are a couple of bugs that happen frequently. The map keeps going black. The game continues but the map is gone and there’s just a black screen. Another is my profile icon changes to another players icon when I pass them. For both issues I have to restart my phone. 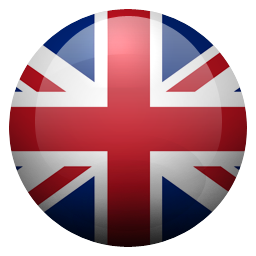 For the icon issue, after the reboot I have to take another step to go into my account settings and change the pic. Also, I love the friends help but sometimes they interfere with pieces that I have lined up for creating super pieces. The player should have control over when to have your friend help you instead of them auto assisting and messing up potential game moves. Level 440 seems to be impossible to beat. I refuse to purchase boosters. I’ve been at this level for literally a week now, and can get the last heart within one block but not to the finish. It’s truly frustrating when you combine a color bomb with a stripe, blow up the ENTIRE play field but the stars move NOWHERE because they haven’t been bumped directly. Like, seriously, what’s the fun in that? I’d rather quit playing than be aggravated. This is supposed to be a stress RELIEVER not stress INDUCER! UPDATE: After posting this late last night, I’ve finally passed the level in question- the first attempt today. Suddenly the “random” colors and such seemed to be much more helpful than before. Could it be that an algorithm was tweaked just a bit? Whatever the case, thanks for the boost. Still leaving it 3 stars for the oh-so-slow earn rate of boosters. It’s a great game undeniably but there would be times when playing with yeti he would completely throw his wrapped candy on the other side of the playing board from the objective, so let’s say it’s spread the jam or free the octopus if I have a few more left and all I need is a well placed wrapped candy to win, he would 5 times out of ten, throw it on the other side of the board (even if there was closer blue candy's to my objective) also he typically avoids throwing his wrapped candy next to a candy bomb (have to tried or tested letting the player control where the special candy is thrown into the board?) if not it’s just a suggestion, it’s still a great game overall I just hope you look into yeti and fix how he decides to throw his wrapped candy. I enjoy this game so much and at times I play so much it feels amazingly addictive. What separates me is when I need to pay for my stars/coins that I played long and at times hard for collected in the Piggy Bank for $3.99. It can keep me from playing this game and paying to break the piggy!!! This may possibly be my first and last time I submit a review about the game. P. S. — I changed my rating because my true “Nickname” can’t be used according to the error message I received. It’s being used (by me), so I must select another name if I choose to send in my review...I doubt very much if there’s many others playing this game that spells their name the same and coincidentally use the same two numbers. Why do I Say it’s TOO EXPENSIVE? Because right out of the shoot you earn a Piggy Bank & You fill it full of Gold Bars only to be Charged $3.99 to Break the darn thing!! What’s that?? WE earned the right to break It!! I know from playing other Candy Crush Games they got Too Expensive to play and that this will come up,that other charges will come, but I’ll bet you that they WON’T let this Review get posted because it’s a Negative Review & I bet I would win!! They Don’t like negative reviews. Just telling the Truth and King Games creators knows that I’m right. Listen, there are A Lot of people that Like their games and really love to play them but don’t have the extra money to Keep Paying out a lot of Dollars to play their games but Love Playing Them. So try giving people a break even if it’s just a token here and there!! Just Sayin. It Will keep us playing. Again, just Sayin. I love this CC version more than the previous ones and have noticed the recent updates (no more pregame bouncing around! Thank you!). Im on level 577 and have not had to spend a penny to get there, so IDK why others are complaining about that. With that being said, I have three suggestions: 1- Make it easier to see when friends are requesting lives. I don’t think people even know the option is there. 2- Make it easier to earn lives other ways!! 3- This one is more of a complaint. I play this game A LOT. Probably way too much, but it’s my temporary “escape” from the day. Sorry, not sorry. Yet my Daily Reward resets back to day 1 every few days as though I missed a day, and I guarantee you this hasn’t happened. Please fix this! It’s a great start and I’m loving the concept of the game like it’s really easy. Lol. Everything is good it’s just that I really don’t like the type of doll like type animation.I understand that it’s also a way to catch children’s eye and play but I think you guys should have just kept the animation like characters regular looking instead of making them all look like one of those things I would make out of newspapers and glue because robe honest who’s writing the review here my son/daughter or me with the Apple ID. It’s also slow like I can’t skip the piggy bank part like in the other games. But besides all that I love the game ( all of them except for candy crush soda)keep up the great game concept of new challenges for me and my mom to brag about when whoever wins. Love the characters different abilities! This is a nice twist of candy crush and collecting games. You collect stickers to get more characters or more costumes. However, I feel like the collected costumes should have a mini upgrade as well. 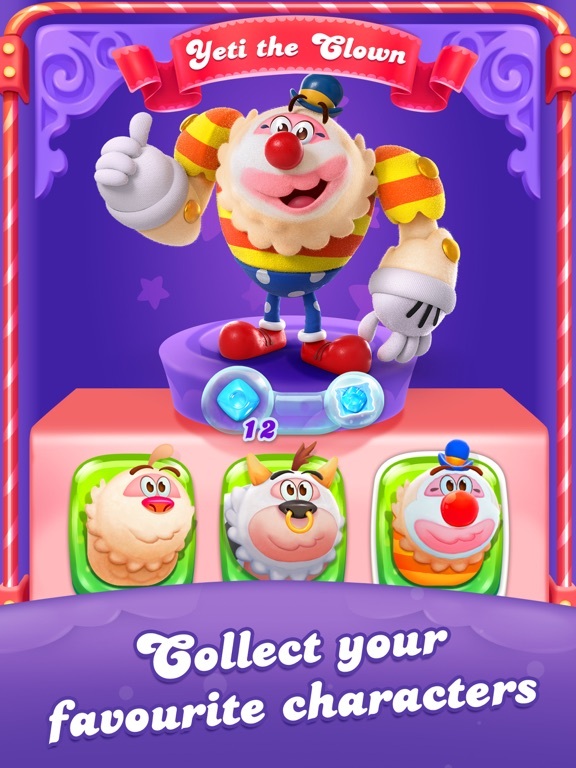 For instance, instead of having to match 10 red candies for tiffi’s ability, you only need to match 9 or 8 to activate it and the same goes for the rest of the characters and costumes. 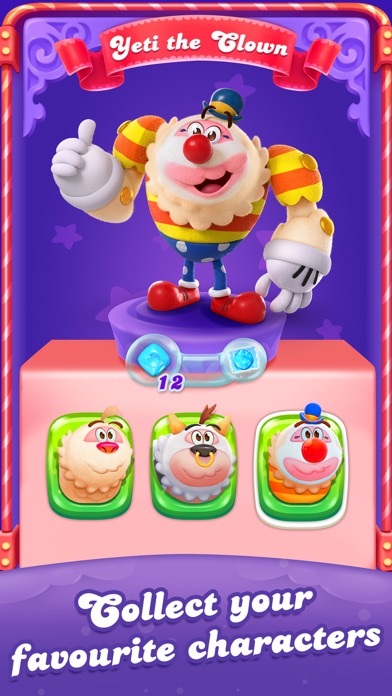 Depending on how “rare” the costume is should increase the ability of the character by decreasing the amount of candies needed to activate them. I also wish that there were more 3D worlds to roam through and more variety of game types. Overall, it is a very addictingly hard game but fun too! The game is cute. It peeves me that if I have 9 lives sent from friends and click accept when I need lives again... what? you don’t say?... my 4 are no longer there. I get the fact that you don’t want us hoarding lives as we could do in your previous games, but if I feel cheated I will not spend money on a game. So, forget about “feed the pig”. Also, I would very much like to see where my friends are on the map. It annoys me that I can only see ppl in my section. A few of my friends and I compete and they have to tell me where they are. I can’t check scores either. Playing with MY friends makes the game a bit more fun, but without that feature and the “cheating” (didn’t mention all the little things I notice) I will soon quit this game as I did the previous ones if things stay the same. After 3400 levels in the original CC Saga my supplies burnt out and the levels take days of daily rewards and free spins to get the kind of powers needed to beat them. So I love the new game - challenging and new variations, including the direction the boards move besides just straight down. But the single free switch is greatly missed, and opportunities to win gold, and maybe some free spin thing or a special large gift for each significant daily reward. (I’m on 33 days and not planning on stopping soon. I sure could use some lollipop hammers!) Not everyone can afford to spend cash freely on a game. I spend a little on one game each year for my birthday, right now it’s going to be spent on Candy Crush Friends. STOP COMPLAINING ABOUT THE DANCING!!! I had already my review written, but I just can’t with all the comments complaining about the characters dancing when finishing a level! PEOPLE, Y’ALL CAN SKIP THE “ANNOYING” CHARACTER DANCING BY TAPPING THE SCREEN AND THEN TAPPING THE BIG A*S “NEXT” GREEN BUTTON TO KEEP GOING. Y’all could leave a review asking to update so we are able to actually receive lives from friends instead of having to wait for lives to refresh by themselves in hours, y’all could contribute with suggestions to improve the game so we all players can benefit without having to spend real money and what do y’all choose?? To complain like a bunch of crybabies for graphics that are thought with kids in mind, so the game can be kid friendly. Remember: tap the screen when the character starts dancing and then press the green, “Next” button to skip the dancing. You’re welcome. I’m a Candy Crush Saga addict and I’m almost to the max level and so I was needing a new time waster. 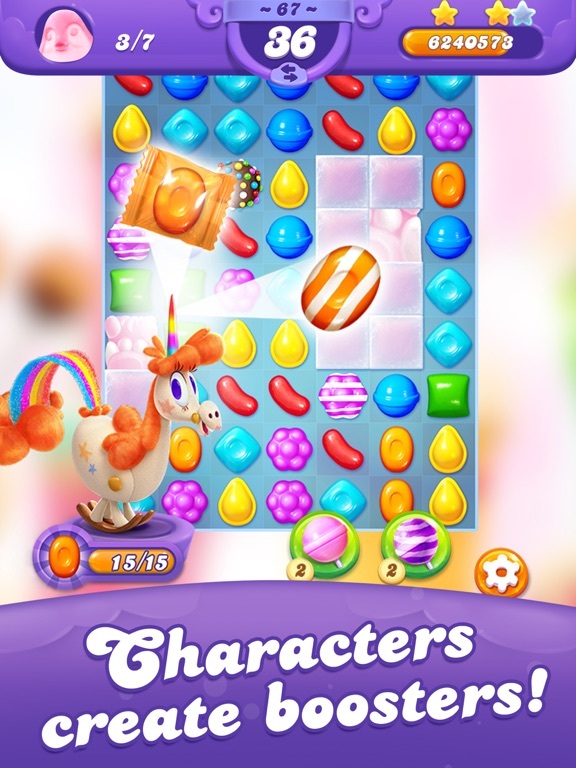 I didn’t really like the other Candy Crush games, but this one is great. It’s way more challenging than Saga which is great, but also frustrating at times. I like the addition of the characters and their power moves. It replaces the need for most boosters. However, it would be nice if Candy Crush came out with a head-to-head version where you can play against other people. I wish the good bars cost less than $3.99 though and it was cheaper and easier to get the different lollipop boosters. Overall great game, fun graphics, creative design. 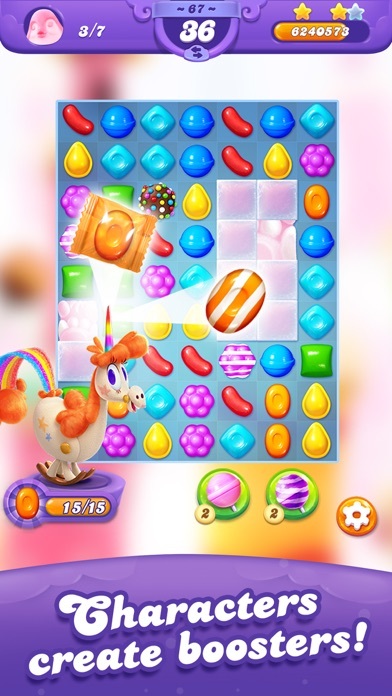 As expected of a candy crush game it is a decent puzzler that can kill time. But also as expected you are constantly prompted to BUY BUY BUY! Earn gold bars but BUY the ability to use them. They occasionally throw in “hard” levels which are less about being hard and more about luck of the draw so it encourages you to BUY more just to progress past an annoyingly designed stage. These games are no different then the arcades in a casino. Expect you don’t have the sliver of chance of making money back. Got tired of waiting for lives to refill and not about to spam my friends on Facebook or spend money just to play for 5 more chances to get sick of the same “hard” level. Just for the record. I would gladly spend $5 or even $10 for a game like this that did not have ads and try to nickel and dime you. Hopefully King will read this!!!! I do like the game! The characters are cute but sometimes the levels seem impossible to win!! In the beginning of the game when the characters I guess introduce themselves is ok at first but after a while it gets annoying (especially tiffy) and also when I ask for lives no one sends me squat back and I’m tired of it I always send people requesting lives and I don’t get any back when I need them!!! Frustrating!!!!!! So if you can make it to where I can ignore requests from certain people that would be nice 👍 or at least let me choose who I want to send them too cause other players ask and ask and don’t send any back!!! That would be awesome!!! Maybe I missed something, but is the game finished, or are you updating? I like the game, I like almost all the King games. I would have given this one five stars but, there are a couple things in my opinion that needs changed. For one, the gold bars. It is a little ridiculous to have to pay 4.00 for them when you fill up the piggy bank. I’ll never pay that, I might pay .99 (like the mobile games used to be, lol) Secondly, when you ask your friends for lives, where does the request go? This is the part where I think the game is still a work in progress. I send my friend request for lives, and she has sent them to me, but neither one of us has seen the request to send them back. I have even logged on with my laptop through FB. Update: so far with the updates, still waiting on lives given and received from friends. Been playing from almost the the beginning and have only gotten 2 lives that my friends have sent me. And have only gotten three request from my friends for lives. Can’t see where my friends are are on any map unless they are on the same map as me.